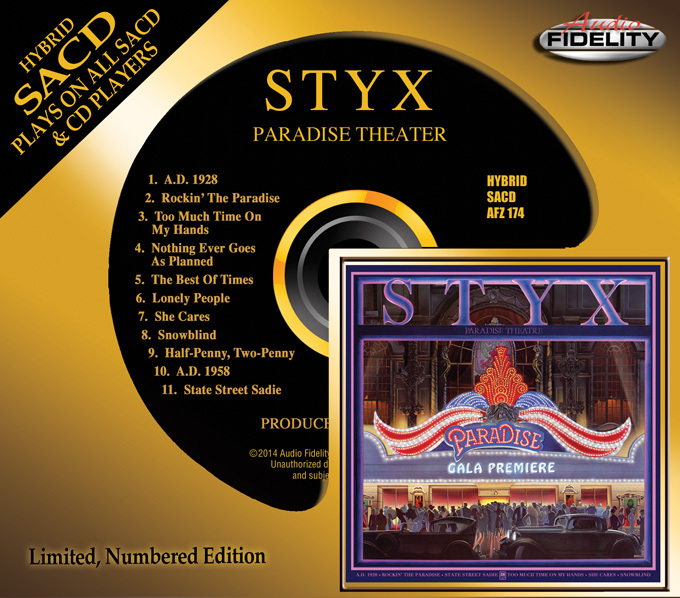 Styx ‘Paradise Theater’ Album To Be Released On Limited Numbered Hybrid SACD! Camarillo, CA – Styx fans rejoice with the release of the band’s critically acclaimed album ‘Paradise Theater’ on limited numbered Hybrid SACD by Marshall Blonstein’s Audio Fidelity. Styx’s 10th album, the 1981 release, ‘Paradise Theater’ was the band’s fourth consecutive triple-platinum album. A resounding success, ‘Paradise Theater’ was their greatest commercial triumph and their only #1 album. It remains one of the best examples of the convergence between progressive rock and AOR which typified the arena rock sound of the top groups of the late-seventies and early-eighties such as Journey, REO Speedwagon, Cheap Trick and Kansas. Styx was a great group of talented musicians – Dennis DeYoung, Tommy Shaw, James Young, Chuck Panozzo and John Panozzo. The album included three Billboard Hot 100 hits, “The Best of Times,” “Nothing Ever Goes As Planned” and “Too Much Time on My Hands” considered among Tommy Shaw’s finest singles ever. Another track, “Rockin’ The Paradise” reached #8 on the Top Rock Track Chart. The concept album is a fictional account of Chicago’s Paradise Theatre from its opening to closing, used as a metaphor for America’s changing times from the late 1970s into the 1980s.